And Jesus, moved with compassion, put forth his hand, and touched him, and saith unto him, I will; be thou clean (Mark 1:41). .... For I am the Lord who heals you (Exodus 15:26). splanchnízomai, splangkh-nid'-zom-ahee; middle voice from G4698; to have the bowels yearn, i.e. (figuratively) feel sympathy, to pity:—have (be moved with) compassion. I have compassion on the multitude, because they have now been with me three days, and have nothing to eat (Mark 8:2). And Abraham said, My son, God will provide himself a lamb for a burnt offering: so they went both of them together (Genesis 22:8). And ofttimes it hath cast him into the fire, and into the waters, to destroy him: but if thou canst do any thing, have compassion on us, and help us (Mark 9:22-25). And the children of Israel remembered not the Lord their God, who had delivered them out of the hands of all their enemies on every side (Judges 8:34). And when the Lord saw her, he had compassion on her, and said unto her, Weep not (Luke 7:13). Comfort, comfort my people, says your God (Isaiah 40:1 ESV). 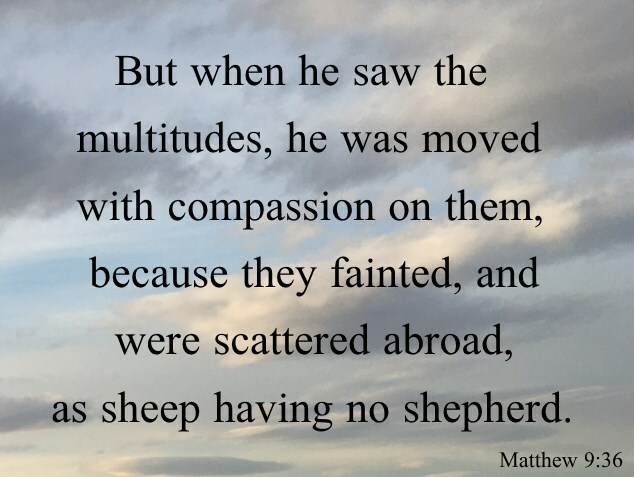 But when he saw the multitudes, he was moved with compassion on them, because they fainted, and were scattered abroad, as sheep having no shepherd (Matthew 9:36). Truly, O God of Israel, our Savior, you work in mysterious ways (Isaiah 45:15 NLT). Lord Jesus, we are truly grateful for your compassion on our lives. Hallelujah!